Hayden and yourself also produce (and perform) under the monikers Antix and Fiord – can you tell us how “Out of Sorts” came about? We were keen to produce a deeper, slower vibe. We could have done this under one of the other monikers, but we wanted to start fresh - new name, new vibe. It was a good move too, as one of the first remixes we did under OOS was for Kompakt! There a few milestones. It’s hard to pinpoint just one… but I guess the first release on German label "Plastik Park" who then took us on a tour of Germany way back in ’99 really stands out - that was a pretty big moment. All of our albums," Lull’ in particular, as it was a fresh approach as to what was happening at the time. "Twincoast Discovery" was a close second. We're also pretty chuffed with the new label we're doing - ‘Beat & Path’. A big part of this is bringing new artists to a world stage - giving something back to the scene. There is so much good music out there, but Maceo Plex is someone we look up to for his production. Also, our old friends D-Nox & Beckers, and what Frankey is doing with Sandrino is cool. We're definitely slowing things down and enjoying working with vocals, live recordings of drums and other instruments. Can you tell us a little about you production method? And do you have any advice for amateur producers / DJ’s in the scene? We work a lot with outboard equipment, but also work quite a bit with plug-ins. Our usual process is jamming with a loop while recording to find a nice pass on one of the synths - either the SH 101, Moog or Juno - and once we're happy with something we add the on-board effects. My advice is do what you love and do it for the right reasons. Work hard and good things will happen. All sorts of stuff, but me personally I was into bands like The Smiths, Stone Roses, Public Enemy, The Orb, then onto PlastikMan which eventually led me to techno and so on. That's too hard, so many good ones. But if I had to go one.. The Smiths - The Queen is Dead. How does the electronic music scene in New Zealand differ to Australia? It’s a lot smaller, with less people so it's harder to get the numbers and support. The 4 o’clock finish definitely doesn't help the scene! It’s definitely getting better though, with promoters taking note of whats happening in Melbourne and Europe. And there's a few tasty little boutique festivals coming along like ’Shipwrecked’. ‘Womb’ in Tokyo, or a random warehouse party we played in Brooklyn, New York. 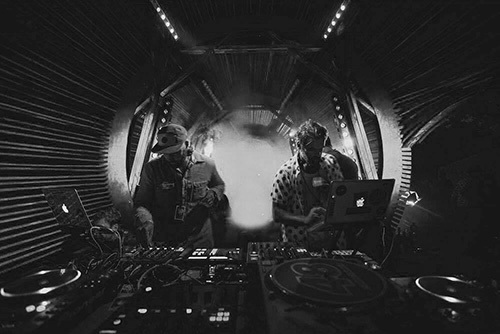 'Let Them Eat Cake' on NYD in Melbourne is one of our favourites, and recently 'Rainbow Serpent Festival' - both on the Market Stage and closing the BBB Theme Camp... all epic times! Creativity, and being able to share your creations with like-minded people. Also, a sense of communicating through music and ultimately making people happy.